If you are living with broken, damaged, or painful teeth, you are probably not only in constant discomfort, you are likely self-conscious about the appearance of your smile. Your teeth can be repaired, function perfectly, and look better, all at the same time. Restorative dentistry gives you a fully functioning smile once again with natural-looking solutions to your oral health problems. Restorative dentistry procedures are completed by Philadelphia dentists Dr. Ken Cirka, Dr. Jessica Meier, Dr. Mimi Jeon and Dr. Stephanie Smith and our gentle, patient-focused team in our Center City dental office. Today’s modern restorative dentistry solutions can repair damaged or broken teeth and replace missing teeth, all while creating a beautiful new smile that looks amazing. When your teeth are in disrepair, you may feel like you’ve reached a point where there are no solutions, but avoiding the dentist is no solution either. Your oral health problems will not go away on their own. In fact, they will only get worse without a dentist’s help. The good news: Restorative dentistry from our Philadelphia dental office can be your solution, no matter what oral health problems you have. Dental Implants: Dental implants have fast become the popular restorative dentistry solution for missing teeth, particularly for patients who are not interested in dentures and the adhesives that come with them.A permanent restoration, an implant takes the place of the missing tooth’s root, stimulating the jawbone and helping your face maintain its shape. A natural-looking prosthetic tooth is attached to the top of the implant once the area has healed, completing your strong and beautiful smile. Dental Crowns: Teeth that are significantly damaged by a crack or chip are at risk of developing even bigger problems. Broken teeth not only cause discomfort and look unsightly, they are an opportunity for bacteria and plaque to find their way into your tooth. 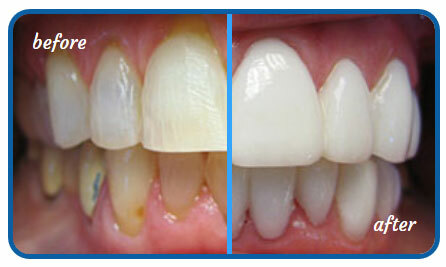 Infection, pain and oral health complications can follow if a crown is not used to repair and restore the tooth. If you already have a cavity, it may be so large that a dental crown is the only solution to cover and save that tooth. Dental Bridges: When you are missing a tooth, a dental bridge is an excellent restorative solution. Crowns are attached to the teeth on either side of the missing tooth, allowing them to serve as anchors for the bridge which is then topped with a prosthetic tooth. This permanent solution eliminates the hole in your smile while protecting nearby teeth from shifting to make up for the space between your teeth. Smile Makeovers: Just like all restorative and cosmetic dentistry solutions, a smile makeover is customized to each patient. Whatever oral health problems you’re experiencing, there is a menu of solutions and an order in which to apply them to give you the amazing smile you’ve always wanted. Smile makeovers can be restorative alone, or just cosmetic, or a combination of both.Our goal is for each smile makeover patient to leave our Philadelphia dental office feeling like a new and improved version of themselves. A healthy and beautiful smile can make all the difference in your life, personally, professionally, and socially. If you are tired of being embarrassed to smile because of your damaged, decayed, or missing teeth, it’s time to pursue flawless, white teeth. Enhance your appearance. Boost your self-esteem. Restorative dentistry can give you the attractive smile you want. If you are embarrassed to smile because your teeth are damaged, aging, discolored, missing, or broken, our Philadelphia dental office is here to help you achieve a new smile. Your smile is one of the first things people notice about you, and it can affect how successful you are in social and professional settings. Don’t settle for a smile that is less than perfect. There are solutions for your oral health problems, no matter what you’re experiencing. Restorative dentistry procedures are customized to every dental patient at our Philadelphia dental practice. We can repair and replace teeth to give you a customized smile makeover that looks amazing, works perfectly, and lasts a lifetime. Call our Philadelphia dental office today to find out how restorative dentistry can fix your smile: (215) 866-1800.